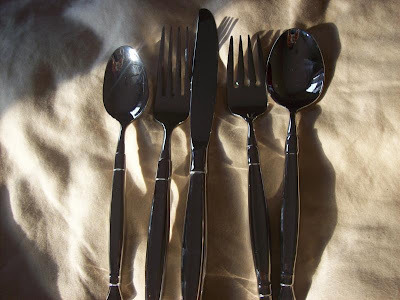 Oneida surprised me by sending me this 20 piece flatware set for review on my blog. I had already done a review for them on their Culinaria dinnerware line which I love and then was excited to see this flatware set show up in the mail! The line that I got to try is called Act 1. Here is a little bit of information about this line of flatware: "Back by popular demand Oneida reintroduces Act 1, a chic, stainless steel flatware and serve ware collection that is being taken out of retirement and is now available for all customers. With raised geometric bands near the tip and neck along with a high mirror handle, this Art Deco look brings style and function to the table." My Opinion: I really like this flatware because it is so different from the silverware that I have now. Mine is very fancy and I like this line because it is simple for more simpler meals. It seems to be very nice quality which is great because that means that it will last! Where to Buy: You can purchase this line of flatware on the Oneida website starting at $49.99.